The ever classic and elegant Taylor Swift has been chosen as ELLE Magazine Canada's new cover girl for their December 2012 issue. Looking the perfect picture of beauty and grace Taylor shines in truly dazzling gowns befitting a feminine and demure country pop princess like herself. Her fashion in this issue literally jumps off the page, the ravishing dresses are so striking they make you want to run away to a ball to meet prince charming and find your own Love Story, in true Taylor Swift fairytale style. The flawless-faced hopeless romantic dons her signature RED lipstick and always charming smile to win over ELLE's large readership with just a flick of the page. I am really starting to like Taylor Swift. Gorgeous gowns. She's really grown up. The first cover is amazing! 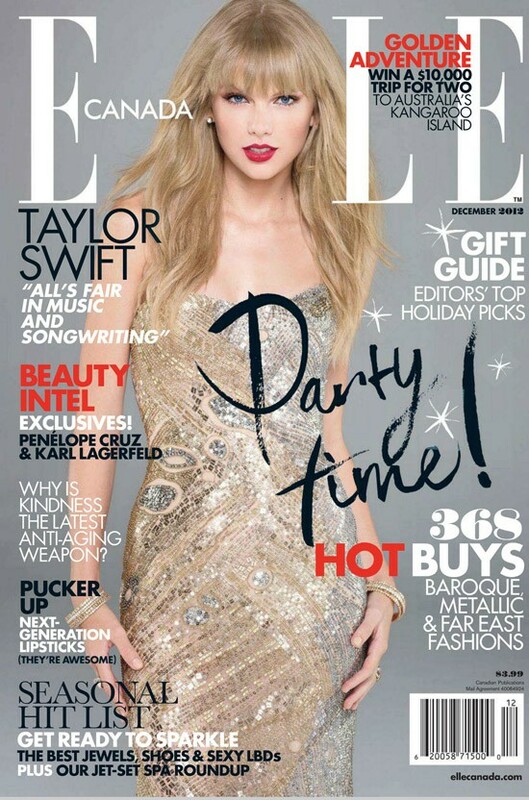 I might not be totally into her new music...but I totally love her on the cover and in ELLE!! Ah Taylor Swift, your music is fun but i'd hate to be in a relationship with you. Adore that seond dress! She looks absolutely stunning in these photos! Taylor Swift looks stunning as always!